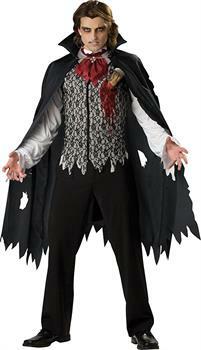 Unleash your inner blood sucker with this men's Vampire B. Slayed costume! 100% Polyester costume consists of a cape, vest and shirt combo, ascot and attached realistic vinyl stake that stands by itself. Adult sizes. Shoes, pants and other vampire accessories not included.